Recently I’ve been developing a WordPress plugin to extend WP e-Commerce, a free storefront plugin. I used to use osCommerce, a robust PHP solution for shopping carts and heavily customized it. I was looking at this implementation of osCommerce (a great effort) as a WordPress plugin, but it was like reinventing the wheel–not worth it. WP e-Commerce is a native WordPress plugin, works well, has a huge user base and is (mostly) easy to extend. It’s this the main query? The main query in a WordPress site is the query based on the URL being accessed. When you access this post’s single page, the URL indicates the main query is the text you are reading right now. The “Recent Posts” widget on the sidebar is generated from a query, but not the main query. In situations where I wanted to alter the content of a post (in the loop) if it was the main query, the above methods didn’t work reliably. I attempted to hook into the pre_get_posts action and set a global variable, which I would then test in the content filter function. I reasoned that the variable would be set to true before the loop, and then set to false if another query was called after that. The results however were always false. Now it’s quite possible this is not the most direct, efficient or reliable method. I welcome your comments if you have suggestions or concerns. It’s documented, it’s used, but it wasn’t obvious to me. After hunting around, I finally found what I needed in the first place I looked: the WordPress Codex. Using the term ID as a cat ID wasn’t working. I came across the above here, and used it in two simple loops to display the custom posts under category headers. Want to display posts in a nested hierarchy? This goal led me to what is probably a cleaner solution. The following code is adapted from Hierarchical Category List with Post Titles, and blended with the code above. Many times I’ve needed to display or hide a widget based on some condition. Usually that condition is which page is being served. That’s easy enough with my own widgets by wrapping the output in an if statement employing a built-in WordPress Conditional Tag. The same can of course be done by directly editing 3rd-party widgets/plugins. What if you need to change the behavior of a 3rd-party widget, but don’t want to alter it’s code? There’s a great plugin called Widget Logic that can help you do just that. The only caveat is that it directly runs code that you input. That opens up a security hole by executing code stored in the database. Not always a show stopper, but when developing for clients I try to play it safe. Almost all the code and comments below are borrowed directly from the Widget Logic plugin. I’ve greatly simplified it to effect only the widget(s) and condition(s) hard coded. Also I removed the filtering function, as I was only using this to hide or show a widget. If you want to alter the output of a widget, it’s a pretty simple copy and paste from the original plugin to the second function. These commands are especially useful in remote access situations, using ssh. 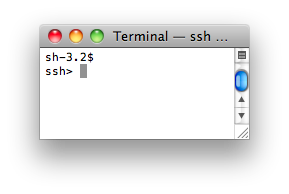 See my post about SSH here. These commands all work in OS X 10.7 Lion. Many of them will not work in earlier versions of OS X.